It perfumes the skin with the fresh and energising scent of cedrat, while efficiently preventing body odor. 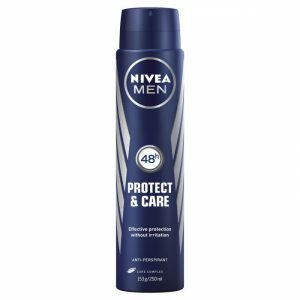 Nivea Stress Protect Deodorant combines stress-protect actives and a zinc complex to give reliable anti-perspirant protection against emotional sweating and body odour. 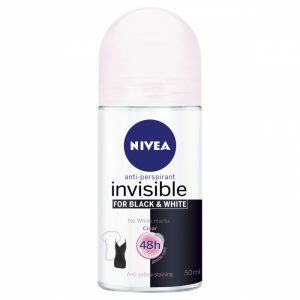 Nivea Invisible for Black & White Clear Anti-Perspirant Roll-On offers more than anti-perspirant protection. 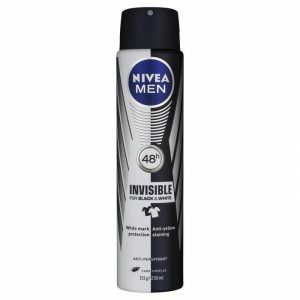 Leaves no white marks, provides 48h clear gentle care with anti-yellow staining. 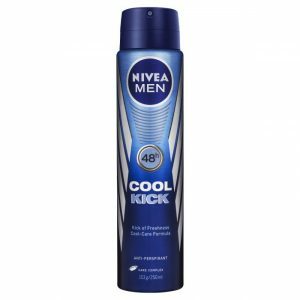 Nivea Men Cool Kick Aerosol Deodorant offers the real confidence of effective 48 hour regulation of perspiration with a kick of freshness. 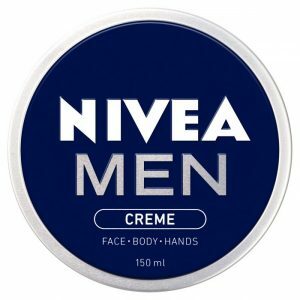 The optimal combination of reliable antiperspirant protection and niveas mild care. 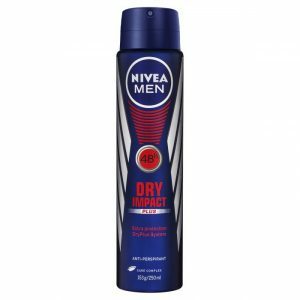 Nivea Men Dry Impact Aerosol Deodorant offers advanced regulation of perspiration, guaranteeing a dry skin feeling. 48 hour anti-perspirant protection. 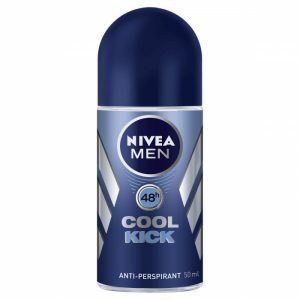 Nivea for Men Stress Protect Roll deodorant provides protection against sweat and odour, even in stressful situations. 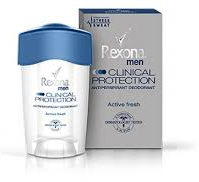 Contains stress protect actives and zinc complex with 48 hour antiperspirant protection. 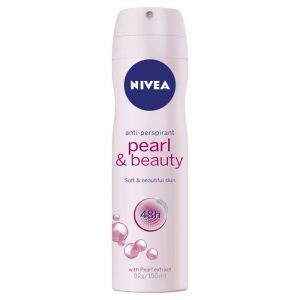 Nivea Pearl & Beauty anti-perspirant with precious Pearl Extracts offers more than anti-perspirant protection, It’so provides soft and beautiful underarm skin. 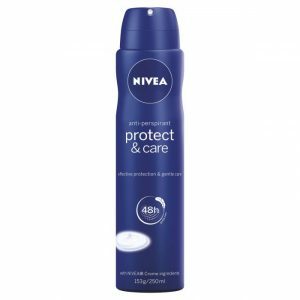 Nivea Protect & Care Anti-Perspirant cares for your skin whilst effectively protecting you against perspiration and odour all day long. 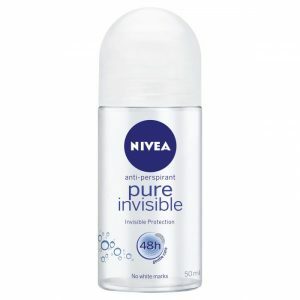 Nivea Pure Invisible Anti-Perspirant with no alcohol or colourants provides gentle care with no white residues on skin and clothes. Nivea Silk Touch Anti-Perspirant provides quick dry & silky soft skin feel. 48h gentle care with ultra-light Kaolin powder. 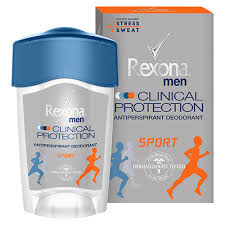 Excellent antiperspirant protection for men. 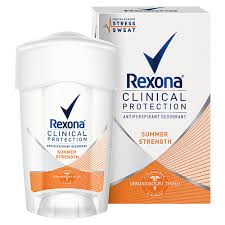 Rexona Clinical Antiperspirant Men Sport provides clinical strength protection against wetness and odour for heavy sweating. 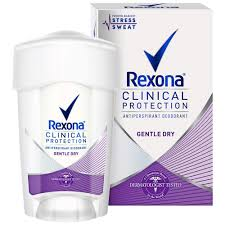 Rexona Clinical Protection provides our most advanced, long-lasting protection against wetness and odour, yet is gentle enough for everyday use. Summer Strength Clinical Protection antiperspirant deodorant keeps you dry, fresh and confident on those long, hot summer days. Rexona Clinical Antiperpirant Shower Clean for women offers up to 3x more wetness protection than a basic antiperspirant deodorant, yet is gentle enough for everyday use.